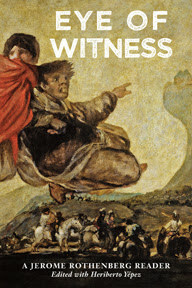 Monday (September 16) is the actual publication date for Eye of Witness: A Jerome Rothenberg Reader, co-edited with Heriberto Yépez & published by Black Widow Press (Joe Philips & Susan Wood) in Boston. The design of the book follows the layout of my anthologies such as Poems for the Millennium & Technicians of the Sacred, which makes it different in format from other “readers” & a way of treating the range of works (poetry, prose, performance, plays, poetics, visual, verbal, & vocal, translations & variations) that I’ve been into over the last fifty years, even more. For further information you can check the Black Widow site at http://www.blackwidowpress.com/ or try your luck with SPD & Amazon, etc. I would also be curious to hear if anyone out there has an interest in reviewing or in setting up readings, particularly in the northeast and midwest, for this coming spring, when other engagements will be bringing me that way. I’m very happy anyway that this is happening as I move forward, as always, on the next big book. Fifty years in the making, Eye of Witness is the culminating work of Jerome Rothenberg's lifelong project, to construct a grand collage (R. Duncan) that brings together a wide range of poems and other language works (verbal, visual and vocal; on the page and in performance; as poem and as poetics) and in the process speaks to and of a larger humanity with which and to which the poet acts as conduit and witness. In his own words in summation: "Two final points: first, my pursuit of a kind of transcultural or global poetics: a poetry rooted in its place but capable of crossing borders and languages to become a virtual omni - poetics. And secondly that that move in its later stages explores a multivocal poetry of witness -- the ubiquity of an I-as-speaking-subject that we all share -- personal and transpersonal at once." "For us, [Jerome Rothenberg] played (and plays) the role Picasso and Braque did for the painters, and Leiris and Bataille later for the French poets: opening the sparkling world that comes when you crack open literature and see the primal gestures of oral energy and sudden imagery from which it all surges. Kabbalah, cave painting, Iroquois legend, Navajo chant, Hasidic tales, Central Asian epic, German avant-garde, immigrant histories -- he summoned us to attend to the deep literature of which the 'literary' is only a sheen … He is a great figure, who stands above and beyond the schools and tendentiousnesses of poetics; he has given us, in his poetry, criticism, translation, anthologies, a body of work that exhibits what I suddenly realize is an ethical purity, a touchstone for the genuine." "Jerome Rothenberg has done as much as anyone over the past half century to shake up received ideas of what poems ought to be like, by demonstrating or suggesting an endless profusion of other pathways, other shapes, other stances, other contexts: as if to say that it is always possible to begin over, to invent new rules for the most ancient of games, not once but over and over. now to the rest of his poetry -- a body of work still underrated, in part because his extraordinary work as editor and translator may at times have overshadowed it -- is added this bonus: half a century of work … spilling out in profusion from … all the previous poetry and revealing multiple layers of exploration and invention. [His] is the book of a life, and the book of an era."